A spacecraft in low Earth orbit will move into the shadow of the planet for some part of each orbit. The amount of time spent in sunlight or shadow depends on how the orbital plane is tilted with respect to the Sun. This tilt is described by a number called the beta angle (represented by the Greek letter β) which changes slowly over time. This is an important consideration for operating a satellite because it determines how much solar energy the spacecraft receives. The blue line in the diagram shows the orbital plane around the Earth edge on with a small tilt with respect to the Sun. Once the orbit of a satellite is well known it is then possible to predict how this angle will change over time. Below is the beta angle for the Brown Space Engineering (BSE) satellite EQUiSat during the first year of the mission. The beta angle of EQUiSat during the first year of the mission. When the angle is near zero it spends just over 1/2 of each orbit in sunlight. When the angle is greater than +40 or less than -40 degrees it can spend 2/3 to 3/4 of each orbit in sunlight. The dependence of sunlight on beta angle is shown below. On rare occasions the angle can reach a maximum of 75 degrees which causes the satellite to be exposed to sunlight for 88% of each orbit for a short period of time. This is a significant increase in energy for the solar powered spacecraft. It charges the batteries during the “daytime” portion of the orbit and then uses the battery power to operate through the “nighttime” portion. The amount of sunlight that EQUiSat receives per orbit varies depending on the beta angle. 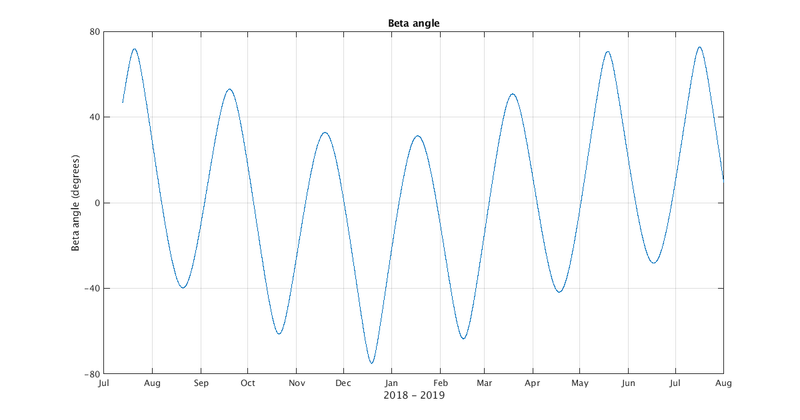 The beta angle reaches a larger value about once per month and is at minimum half way between the peaks. The spacecraft experiences alternating “seasons” of normal or excess sunlight as the orbital plane slowly changes orientation. 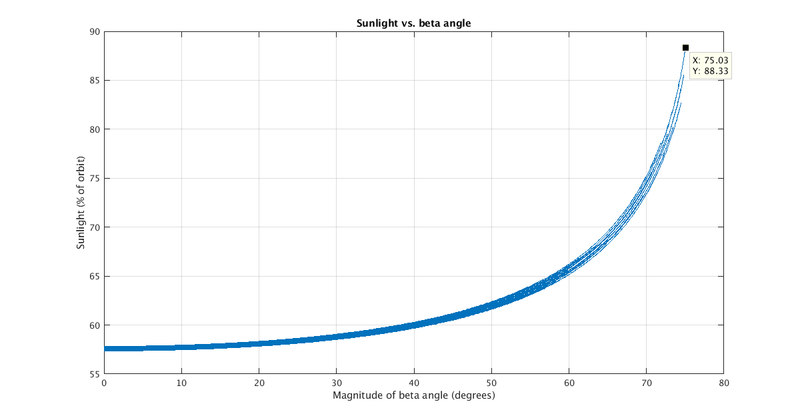 The percentage of an orbit spent in sunlight increases dramatically when the beta angle is near maximum. Shortly after deployment on July 13, 2018 the satellite received a large percentage. During August it was much less. 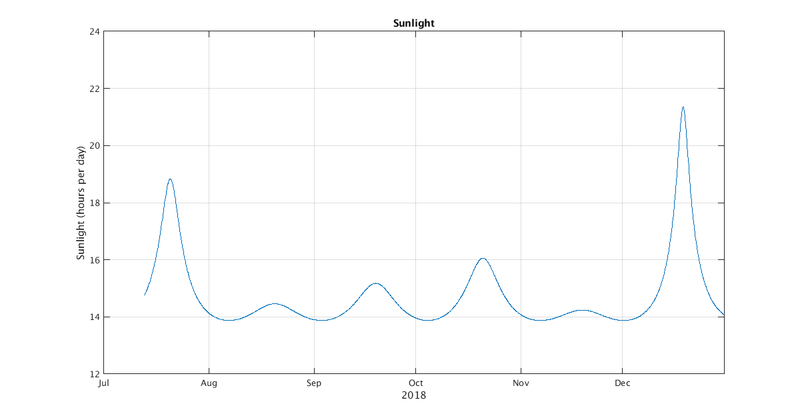 The late December peak will be the greatest amount of sunlight that it has experienced in orbit. The percentage of sunlight per orbit for EQUiSat during the first year of the mission. This pattern results in an amount of sunlight that is typically between 14 to 15 hours per day with occasional excursions much beyond that. In July it was above 15 hours for nearly two weeks and peaked at almost 19. In October it will be above average for ten days and reach a maximum of 16. The December peak is 21.5 hours occurring in the middle of a two week increase. That is the greatest amount of sunlight that a spacecraft in this orbit can get. 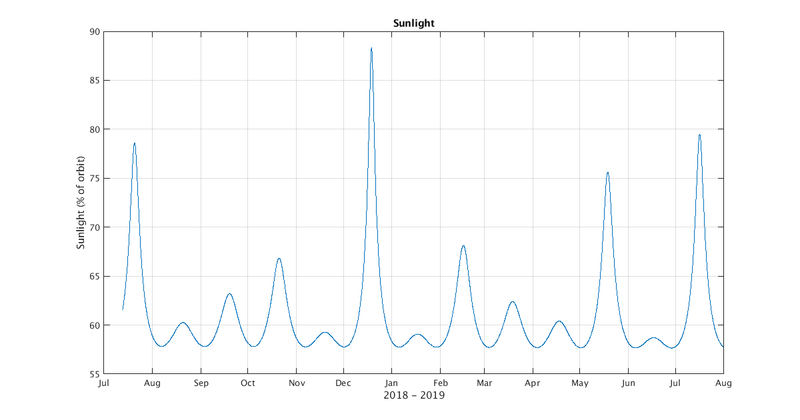 The number of hours of sunlight per day for EQUiSat during the first six months of the mission. The amount of sunlight determines how much solar energy is available to charge the batteries and also has an influence on the temperature of the spacecraft. 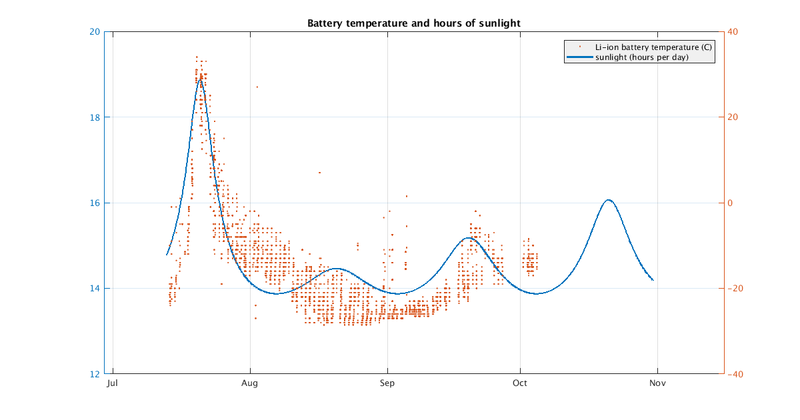 The figure plots battery temperature reported by the satellite along with hours sunlight. An increase in temperature and battery voltage is expected during the third week of October. Notice that there is a time lag after a peak before the temperature declines. The peak in August was too small to have a noticeable impact on temperature. The average temperature of the Lithium ion batteries in EQUiSat is related to the number of hours of sunlight per day.